When Boo decided to become a Satanist, Randy tagged along. They bought themselves leather jackets and dog collars and prepared for the ritual. They had watched enough television to know how that went. Full moon saw both youngsters at the cemetery dragging a bleating Sandy behind. They found a marble tomb and took out the knife. Then sat and stared at the goat. Boo gave out a grunt and snatched the knife, hiding his trembling fingers. The young men were back at the barn faster than Sandy could bleat a reminder that she was still attached to the tree. This entry was posted in Challenges, Fiction and tagged Friday Fictioneers, General Fiction, Humour, Ramblings, Writing Challenge. When Boo decided to become a Satanist, Randy tagged along. They bought leather jackets and dog collars and prepared for the ritual. They watched enough television to know it. Full moon found them at the cemetery dragging a bleating Sandy. 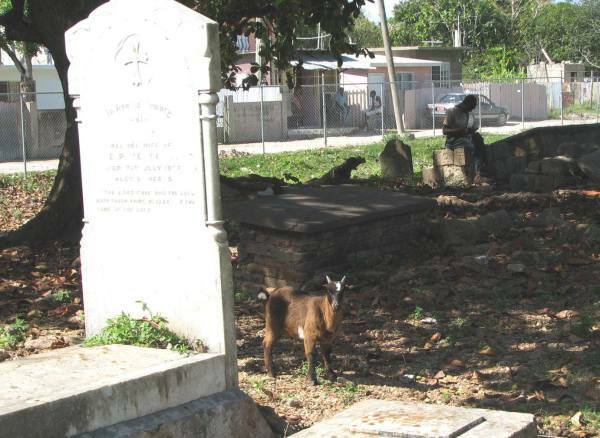 They found a marble tomb, drew the knife, and stared at the goat. Boo grunted and snatched the knife, hiding trembling fingers. The youngsters were back at the barn faster than Sandy could bleat; reminding them she was tied to the tree. This is great!!! You’ve done what I couldn’t do in two days 😀 Thanks. Sometimes it just takes fresh eyes! I just wrote something 500 words over the constraints and I can’t cut it down for the life of me! Some weeks One hundred words seem very little. Funny in both cases! Oh, so true! Wanderer did a great job though! I started laughing at the title and didn’t stop. Poor Sandy, I hope the goat survioves the twig snapper. Haha! 😀 I think she might. Cowards. It seems they bit a little more than they could chew. Phew! I’m happy they couldn’t kill Sandy. Cute story. This is very funny and i didn’t even notice that you exceeded the word limit! Your title, Satanist for a Day, was so good i think I want to steal it. Great story. The funny thing is that titles are usually the things I struggle most with! Thanks for your comment Doug. This was great — the dialogue, the tension. Lovely job, darling. Loved it. Was “Boo” a reference back to “To Kill a Mockingbird”? Ha, how cute a satanist can be, and I guess they would go back to fetch poor Sandy the next day. When they realise she’s missing…probably in broad daylight though.